Despite being under siege from US imperialism and the local comprador bourgeoisie, who have been severely stepping up their acts of sabotage of the Venezuelan people’s economic interests, the people of Venezuela delivered through last month’s regional elections a resounding No to US imperialist attempts to interfere in their country’s internal affairs. A record 61.4% took part in the polls, with 54% of those who voted voting in support of candidates from the PSUV, the Chavista ruling party of Venezuela headed by Nicolás Maduro. This enabled the government party to appoint the governors of 18 of Venezuela’s 23 states. 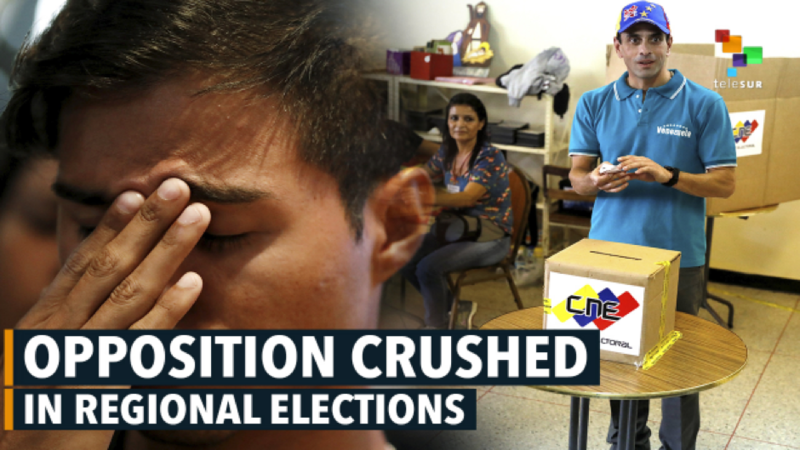 This result came as quite a shock to imperialism that had been confident that its efforts at causing hardship for the Venezuelan people, in combination with the violence unleashed by opposition supporters that has blighted the streets of Caracas for several months now, alongside a deluge of anti-government propaganda issuing from the many and various media outlets controlled by the Venezuelan comprador bourgeoisie, would frighten people away from supporting their government. It turns out, however, that the imperialists have shot themselves in the foot by making the Venezuelan people ever more aware of the fact that it is foreign interference that is the cause of the difficulties that they are experiencing, and that those whom imperialism is supporting internally are nothing but traitors. This was well expressed by Iraida Morocoima, a Miranda state resident and member of a Landless People’s Movement interviewed by Venezuelanalysis who noted that the "lack of respect" of the opposition-held National Assembly towards the people the people, the "unforgivable" violence sparked by the opposition between April and July this year, and the ever-intensifying threats of US intervention helped to build consciousness and a spirit of resistance in the general population. Her view was that for the government to have won the overwhelming majority of the regions was “not just anything, in such a difficult moment, what the people are saying is, ‘bring it on’…the people are conscious of what could come, but the people are not going to let the ‘gringos’ win. We’re not going to make it easy for them." In the meantime, the setting up of the National Constituent Assembly earlier this year is beginning to transfer more power to the people. On 13 October, Venezuela’s National Network of Communes issued a lengthy statement addressed to the Constituent Assembly as to economic and political reforms it expected to be put in place in order to overcome the resistance of Venezuela’s comprador class. It expressed the view that without a communal economy there would be no socialism or revolution and that the new Constitution being drawn up by the Constituent Assembly needed to reflect this reality. We reproduce this interesting statement in full, to demonstrate the growing awareness among the Venezuelan masses of the need to substitute for capitalism a non-market economy producing to meet people’s needs rather than for profit, taking ecological considerations fully into account. The statement does not yet show awareness that the desired reforms could hardly be carried out without smashing the bourgeois state and replacing it with a state of the working class and the peasant masses – a state that would act to suppress the national and international class forces seeking to impede these economic reforms and restore the privileges of the former exploiting class; and instituting a centrally-planned economy catering to the needs of the people. Nevertheless, the statement shows the growing consciousness of the Venezuelan people that even with a progressive, anti-imperialist government it is not possible to avoid economic crisis, a growing divide between rich and poor, unemployment and destitution and environmental damage, etc., so long as the economic system remains capitalist. We men and women of Venezuela, militants of the Bolivarian Revolution, spokespeople of communes and communal councils, of collectives and popular movements articulated through the National Network of Communal Members, exercising the non-transferable sovereignty of the people and as depositaries of the original constituent power, being faithful to the legacy of Commander Hugo Rafael Chávez Frías, taking into account our historical responsibility and the call of President Nicolás Maduro, we went to the National Constituent Assembly, the National Government and the whole country, in order to make clear our position against the new imperialist aggression and to present the proposals to face the serious economic situation that we live as a people. That the Venezuelan people are going through a critical situation resulting from a new scenario of the class struggle that we have called Economic War, carried out by a sector of the international and national right, that is, the parasitic bourgeoisie in alliance with bureaucratic sectors within the State, which is expressed in the galloping inflation, hoarding , reduction of food production, and speculation in medicines, hygiene articles, clothing, footwear and other necessities, attacks on electric, gas, water services, fixed and cellular telephones, internet, attacks on the currency and points of sale, extraction of cash; all of which are triggering situations of poverty, human right to food, health and life. That the situation is aggravated, with the new imperialist aggression turned into economic sanctions and the threats of military intervention against the noble and brave people of our country. That the Venezuelan people do not subordinate their sovereignty to any imperialist force, or to the Creole right, or any person in government that seeks to kidnap popular sovereignty. The Venezuelan people, the sons of Bolivar and Chávez, will be respected! That the Venezuelan people have identified the external and internal enemies, that the time has come to fight effectively with all the weight of the law, against the corrupt sectors within the government bureaucracy that sabotage the public administration, embezzle from the national treasury, hamper the advance of popular organization and carry out actions in favor of the Economic War against the people. That in the face of economic sanctions we demand urgent, concrete, conjunctural and structural solutions of socialist character to the problematic generated by the Economic War. We are the common people who resisted the guarimbas, who shed our blood, victims of the political violence carried out by the MUD, we who heroically came out to DEFEAT once again the empire, by voting massively for the Constituent Assembly and which today requires the ANC to take measures where the people are power. Capitalism by its nature generates exclusion, poverty and destruction of the planet, as a result the Venezuelan people have decided to advance with the Bolivarian Revolution towards the construction of a communal ecosocialist model that surpasses capitalism. The Commune of Chavez is the organizational, political and economic tool through which the people materialize their historical claim while confronted with the political, economic and socio-cultural capitalist exclusion, and is the basis of the Communal Socialist State, heroic creation of the People that will replace the Current Bourgeois Capitalist State. Only the commune, with its organizations and social-productive networks and social and popular movements, can successfully face in a sustainable way the Economic War on the right. It is the people in full exercise of their constituent power in permanent revolution. The economy is the structural basis of society. Therefore, the Bolivarian Revolution without a socialist economy in the hands of the organized people, one that attends to the needs of the people and not to the market, that is productive, efficient, dignifies the worker, with predominance of social ownership of the means of production, with planned distribution and with the organization of consumption; this is possible only through the commune and its various levels of aggregation. There will be no socialism, no Revolution, without the commune and its communal economy. That in 17 years of Bolivarian Revolution, we have had concrete progress in terms of popular organization, participation and political awareness, the formation of more than 40,000 Communal Councils, about 2000 communes and now it is time for to make a definitive and decisive advance to assume Economic Power through the Communal Economy. That for the advancement of the Bolivarian Revolution it is necessary to constitutionalize the People’s Power and the communes with their different levels of aggregation, in their leading role, permanent and binding on the rest of the powers. We wish the government and people of Venezuela every success in their difficult, but noble, task of moving in the direction of a socialist state and a socialist economy.